To set the scene, I have just been dropped off by the Peace Corps at my new home in Satara, India. Satara is in western India about 150 miles (250 km) from Mumbai (Bombay at the time). 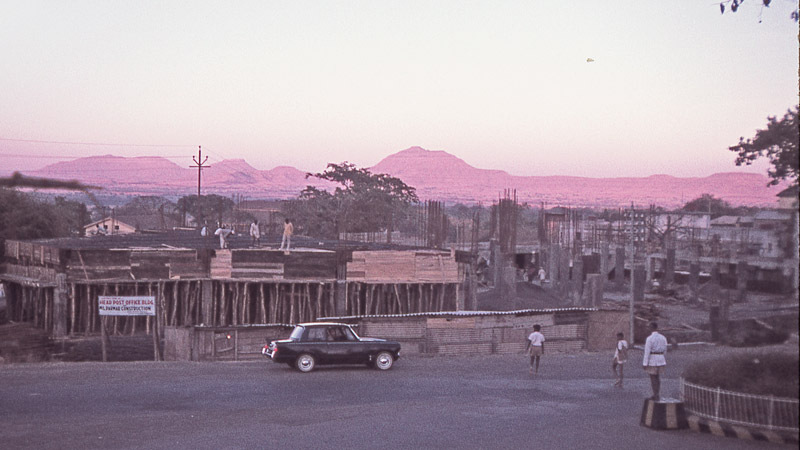 To see the experience of arriving at my Peace Corps station the previous day, see my posting "Memories from India and acquiring my first adult bicycle." The year is 1969. For our transportation, the Peace Corps has given my roommate and me brand new made in India, English style roadster bicycles. My roommate and I set out to explore our Peace Corps home in Satara, Maharashtra. Not too long ago I was apologizing to a Bangladeshi friend for loud chattering children and gossiping adults in a restaurant in Washington, D.C. He looked somewhat surprised. Even though he is a bachelor, he lives in a culture of clamor similar to the first one I had experience in India. He said, “This is not a problem. These are the sounds of life.” I had to agree. The religions in India celebrate life with color, sound and the inevitable joy and pain of living. Sometimes obscured, but giving it order, is a transcendent oneness that underlies it all. It also is something I experienced on my first bicycle ride in India. My roommate Bob and I are ready to take our first bicycle ride in Satara, eager to explore our new home town. We get on our bicycles and head off to our first official destination--the police station. This visit is not for the purpose of registering our bicycles, but ourselves as aliens in a new country. The local police keep tabs on the activities of all foreigners. 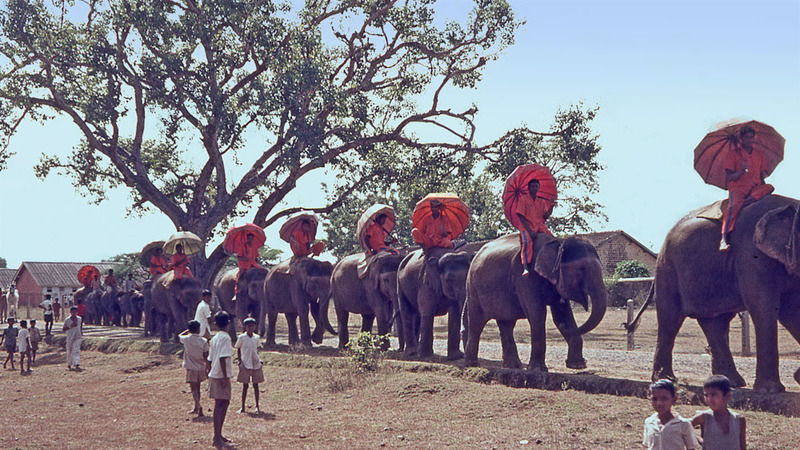 Traveling towards the city from Ghodke’s Bungalow, I first roll past an elementary school with giggling blue-and-white-uniformed children running around at recess. Then I ride by open fields with grazing water buffalo tended by faded sari-clad older women. Exiting our neighborhood, Bob and I hit the main roads and arrive at a roundabout. A policeman with white gloves is directing traffic standing on a concrete podium. In a conservative town with few foreigners, the traffic officer is clearly startled to see two pale, gangly young adults. He recovers in time to give us a crisp salute, as if recalling British times. I salute back. After exiting the roundabout, I am riding on Satara's main road, drifting on a long downhill grade towards the town center. People often say, “You never forget how to ride a bike.” Though true, I'm surprised at the feeling of balance and continual movement with no frame of reference. This is the first time I have been on a bicycle since my childhood. Forgotten childhood images flash through my mind. Simple scenes of going to a corner store and riding with my childhood gang mix with the sights and sounds of Satara. It wakes up memories of that long ride with my brother when we drifted down towards our great-grandmother's farmhouse. Coasting down the hill I remember the feel of balancing on two wheels and flying close to the ground. Today my surroundings are nothing like my childhood memories, with men wearing dhotis walking slowly along the road and a cows meandering down the street. Making my way to the Police Station, the visual treats of India are a blur. I feel like I'm seeing the world through a child's eyes, soaking in all the new experiences, pushing all my sense to a higher level. Riding along the streets of Satara it comes to me that there is no better way to become integrated into a new culture. Perhaps this is my new form of breaking away. During this first ride I'm glad that in Satara a bicycle will be my only means of transportation for getting downtown to the bazaars and shops and also to work in India. Halfway towards the town center I see the police station entrance on the right side of the road. The building is stone, looking like a weighty medieval fortress. With residency forms in hand, Bob and I enter the imposing building not knowing what to expect. Despite our being the only foreigners for miles around, the constables don't appear surprised to see us. As policemen everywhere they make us hurry up and wait. Eventually, we are shown into a room with shelves overflowing with dusty papers tied together with cotton strings. An officer with a serious but puzzled expression stares up at us. He starts to ask us a long series of matter-of-fact questions: “What is the purpose of your being in India?” “Where are you living?,” “How long do you expect to stay?” Though clearly perplexed as to why we would want to live in a place like Satara, he didn’t go so far as to ask if we were American spies. We dutifully explained our mission. I say, “We are American Peace Corps volunteers from the U.S.A., and we are working with the Zilla Parishad (local government). Bob says, "We are living at Ghodke’s Bungalow in Camp Satara and expect to be here for two years.” We alternate response to the matter of fact questions. Satisfied, the officer asks for our papers. He looks them over to see if they correspond to our answers. Then there is a rite of rubber-stamping so common to India that we first had encountered at the airport customs. "Bam, bam, bam." After rhythmic plunging of stamp to ink and then stamp to forms, Bob and I are officially part of the city of Satara. The officer looks relieved with the formalities over and he offers us a nice hot cup of Indian tea. I gladly accept, having learned after my month in India that this was an important social gesture, designed to build trust. After the tea is served by someone called a peon (meaning server), there are more informal questions about life in America. Perhaps the officer is trying to catch us off guard, but I take no notice and answer the questions truthfully. The discussion covers a wide variety of topics about life in the United States and how we are enjoying India. I say in my newly acquired clipped Indian English, "I am liking India too much, sahib." This isn't meant as a mocking kind of accent, but rather it is necessary to be understood. Indian English should be thought of as a dialect and not as a foreign accent. After fifteen minutes of conversation, the social switch turns off. The tea is finished and it is obviously time for us to depart. The officer's bureaucrat personality re-emerges. As we leave, he says cordially, “If you need any assistance, please call on me at any time. I am at your service. Enjoy your stay in Satara.” He bobs his head side to side in a typical Indian gesture. 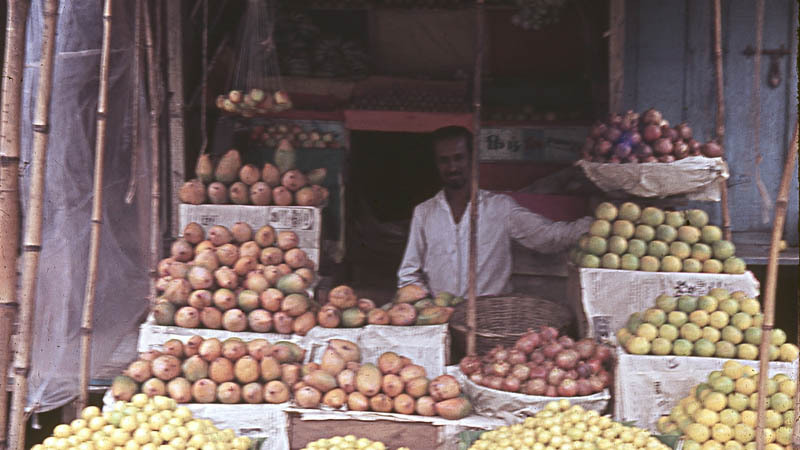 Back on our bikes, Bob and I make our way towards the center of the city, soaking in the views of vegetable stands, street vendors, and other typical street scenes of India. My senses are drinking in an overwhelming diversity of sounds, sights, and smells that characterized my new environment. There is a dizzying blur of people, shops, clothing, colors and architecture. I also hear the grumble of bus engines, the ting of bicycle bells, policemen’s whistles, and the ever-present Hindi film music. With some difficulty, my lungs draw in air filled with smells that are sweet, pungent, and foul alike. Cycling swiftly through the clamor I feel as if I am riding through a kaleidoscope of sights and sounds. More remarkable than the sounds of the city are its colors. 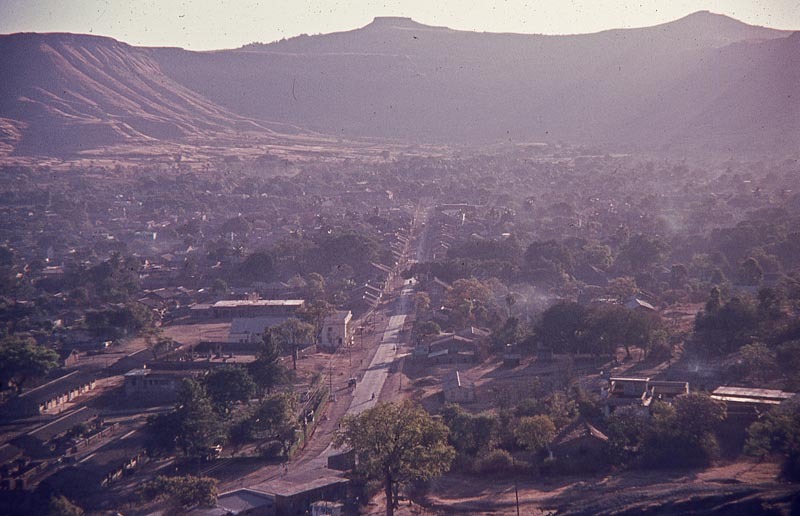 This is the dry season so the hillsides are a light brown, but the city landscape is festooned with bright blue temples, a rainbow of saris, and brightly colored stores. My nose also is not idle, smelling the strong spices of Indian cooking waft from passing food stalls, making my stomach rumble in anticipation. I smell sweet farm smells from straw set aside for animals meandering across the city. On the whole, however, the vibrant colors and joyful, distinctive sounds are pleasant. But vying for my attention are other the other smells of India, such as those from open sewers, cow manure, urine and worse. Behind Bob as I progress slowly down the road. Stopped at an intersection I see a policeman stop a cyclist for a riding on the wrong side of the road. I fear I may be next because I constantly feel like I am on the wrong side of the road since India follows the British tradition of driving on the left side. The policeman’s punishment seems unusual. He lets the air out of the cyclist’s tires. I think that this may have been intended as a warning or just a demonstration of police authority. But without being able to confiscate a license, I surmise that it probably is just a way to make it hard for the cyclist to get back home. 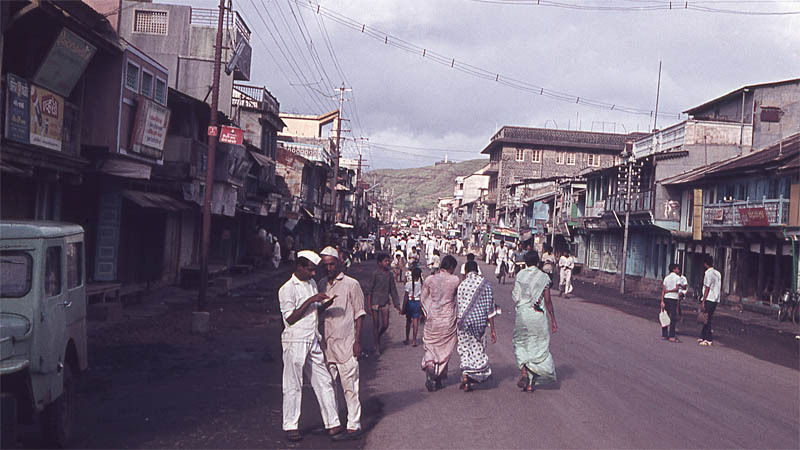 Leaving this drama behind, with Bob I proceed on towards the bazaar near the former palace of the King of Satara. Once India became a secular society after independence, its former royalty was compensated by the Government of India, with many grand residences turned into either private or public buildings. Bob and I park our bicycles in front of the former palace and move around the bazaar, throwing ourselves into its buzz of life. There's nothing like the noise, color and sound of an Asian bazaar. It would take many bicycle rides to Satara for the complexity of new sights, smells, and sounds to harmonize into a beautiful symphony. I appreciated that my first bicycle trip to Satara is something of a sensory assault. The blur of sights, sounds, and smells don't merge together artfully. Overloading my senses it's more like discordant jazz, both pleasing and annoying at the same time. Bob and I return home thankful for the bicycles that the Peace Corps has given us for work and exploring India. As we reach Ghodke's Bungalow, we are physically tired from our ride, but exhilarated from our first day cruising around and the colorful and lively streets while experiencing the energy of the bazaars in Satara, India. See my posting "Memories from India and acquiring my first adult bicycle" for my Peace Corps arrival in Satara, Maharashtra. Subscribe to the Doug Barnes Blog by Email Don’t worry, just postings, no spam. 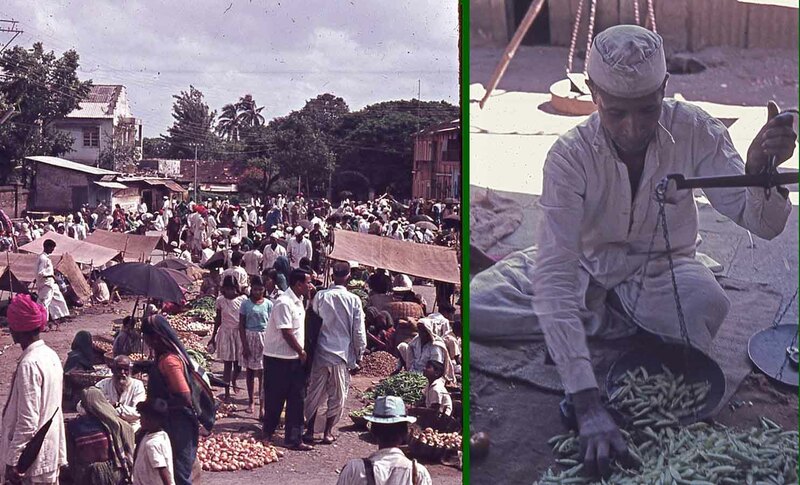 I am present citizen of Satara aged 47,The photographs are of the same year I was borne. It would be great to see if you have more of them.